PUBLISHER: Quadrangle/The New York Times Book Co.
COVER: Two of the greatest authorities on games that combine chance and skill have written the most clear and complete book on backgammon ever. Not only can a beginner learn, but the average-to-good player can skyrocket his chances of winning. 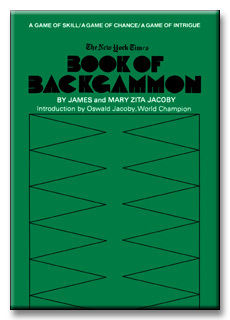 Under the critical eye of Oswald Jacobythe master calculator of odds and 1973 World Backgammon ChampionMary Zita and James Jacoby have pooled their considerable talents and their broad experience in teaching backgammon to proudce a splendid guide for those who wish to become proficient at this popular game. To most people it was just the unused side of a checker board. To a relative handful of others, it was a lively blending of luck and skill promising excitement and surprise. Then during the 1960s backgammon moved out of its longtime habitat, those paneled clubrooms where the loudest sound to be heard was the rattling of dice in leather cups. It spread from Palm Beach and Newport of Acapulco and Lyford Cay, from Park Avenue and Southampton to all the sun and ski resorts where people flew in and out in search of action. Soon there were tournaments with enormous cash prizes in London and Las Vegas, in Biarritz and Beverly Hills, with players gathered from a dozen countries. When newspapers and magazines began to list the celebritiesthe film stars and jet setters addicted to backgammonthe public stirred with interest, bringing joy to the manufacturers of boards and dice. The current craze is reminiscent of the growth of contract bridge forty years ago. Business executives play during lunch, elderly gamesters roll dice in retirement villages, and thousands of families are finding backgammon a welcome addition to their lives. Why the fascination? Because it move quickly, the tide of battle shifting direction as often as a dozen times in a single game as the luck of the roll moves from one player to the opponent. A relative beginner can enjoy himself as much as an expert. Although it requires skill and experience to achieve the top rank, the basic game is easy to learn. And it's even easier when you have available a book as complete and clear as The New York Times Book of Backgammon, with over 150 easy-to-follow diagrams and step-by-step instructions that explain each move, together with a glossary of terms and the rules of the game. AUTHORS: This excellent volume is a team effort by a most remarkable family, the Jacobys of Dallas, Texas. Oswald Jacoby, who introduces the book, is the most famous all-round player of games combining skill and chance in world history, an expert player and author of leading works on poker, gin rummy, canasta, bridge and backgammon. In the relatively short history of international competition he has won four out of seven world backgammon championships, including the 1973 title. His wife, Mary Zita, is a player and teach of the top rankand one of the few people ever able to win an argument with her brilliant, mercurial husband. She frequently lectures on backgammon throughout the country. She has been teaching backgammon for the past 10 years and is considered to be the best woman backgammon player in the world. She has won the first consolation even in two major backgammon tournaments and has been a semi-finalist twice. Their son, James, is well known for bridge exploits, including three world championships. He is co-author (with his father) of the syndicated column, "Win at Bridge." He now devotes increasing time to backgammon and has won at numerous tournaments, including the 1970 consolation event at the World Championship of Backgammon in Las Vegas. He has written Instant Bridge and has contributed to numerious magazines.